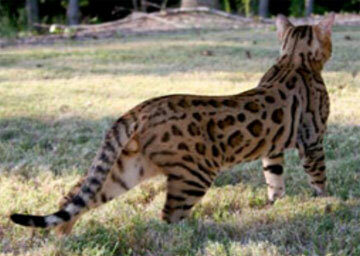 The domestic Bengal cat derived from crossing a Leopard Cat with a domestic cat. The Leopard cat is a small non-aggressive cat indigenous to Asia. History shows that the Leopard Cat is the only true foundation cat for the domestic Bengal cat breed. The first and subsequent generations derived from the breeding of a Leopard Cat to a domestic cat or other Bengal cat is recognized as a domestic Bengal cat. The name Bengal derives from the leopard cat's scientific name (Felis Bengalensis) and has nothing to do with Bengal Tigers. Hybrids of leopard cat and domestic cats have been documented for hundreds of years, including Jean Sugden's (now Mill's) female born in 1963 by a leopard cat female pet that bred by chance to a domestic male cat, but none of these had anything to do with the Bengal breed today. The Bengal breed owes their beginnings to the late Dr. Willard Centerwall's and his Leukemia research at Loyola University. Since the leopard cat can not be infected with feline Leukemia, researchers used them to seek a cure for Leukemia in felines and in other species as well as humans. 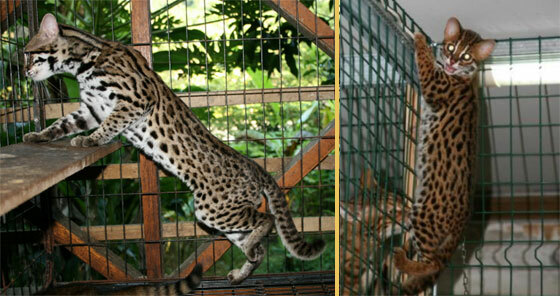 Researchers crossed the leopard cat with the domestics to study the differences in the offspring. The National Institution of Health (NIH) has been and still are utilizing the early generation Bengal cats in their feline genome mapping project and the work done in the feline genome project has been of a tremendous help in the human genome mapping project, in which new gene manipulation techniques are being devised to 'cure' diseases at the genetic level. Many breeders are still contributing blood samples from their early generation Bengal cats for this research. In the early 1980's when Dr. Centerwall became ill, Jean Mill acquired several F1 leopard cat hybrids from him. These were some of the first domestic Bengal cats and most Bengal cats today can be traced back to these cats. Jean Mill said her reason for breeding these hybrid cats was to put a wild coat of the leopard type cats on a domestic cat, in an effort to stop the sales of fur coats. She felt this would make it hard to sell fur coats of skins that looked like pets and would help stop the trapping and killing of these animals in the wild. Around the same time as Dr. Centerwall's Leukemia research, Doctors Greg and Elizabeth Kent of Kansas were making some of the first Bengal cats by crossing their Egyptian Mau's with their leopard cat, Baghara Khan. Later Jean Mill also bred two female cats to Baghara Khan of Kent. 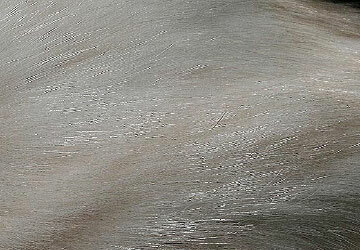 The Kent lines are still a very sought after line and considered by some as the "Pure Bengal" line. The benefits of a hybrid are enormous. Bengal cats are one of the healthiest and most intelligent of all breeds of domestic cats and are very prolific. Many breeders that breed Bengal cats today, do so because of all the health and breeding problems they have had in the past with other breeds of cats. Bengal cats are not a genetic threats to other breeds of cats, to the contrary, they may hold the key to the future health of all breeds of cats by contribution of new genes to other domestic cats if ever needed. 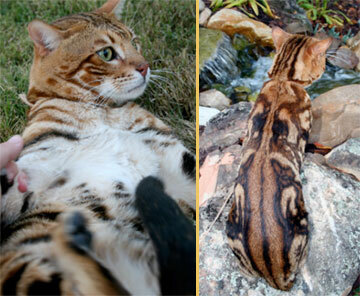 The first generation of a leopard cat crossed with a domestic cat is known as an F1 (Filial 1st generation) domestic Bengal cat and has a very wild and beautiful appearance. To date, all male F1 and almost all F2 male Bengal cats are infertile, making it much more difficult to preserve these characteristics in further generations. Although the F2's and F3's are also very beautiful, they tend to have a more domestic cat appearance. Now with top quality Bengal cats available there is no need to bring in any other breeds of domestic cats. 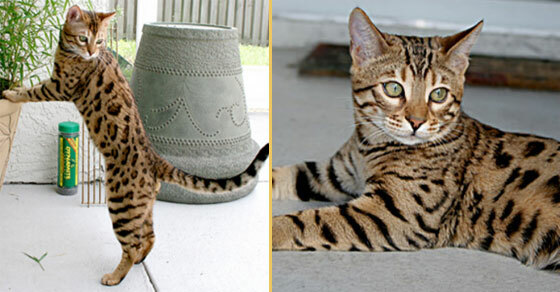 Even the fourth or more generation domestic Bengal cats are very unique, beautiful cats that needs no special care or food. They are very loving, devoted pets, many loving to play fetch or to take a bath with their owners. Bengal cats usually get along well with other cats, pets and also sensible children. Most people feel they have a personality more like a dog than a cat because they are very people oriented. On average, female Bengal cats weigh between 6-12 pounds and male Bengal cats weigh between 10-18 pounds. 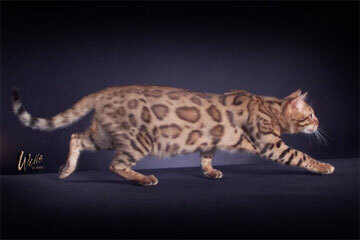 Most Bengal cats have short, silky hair and are very athletic (loving to jump high up at their toys). 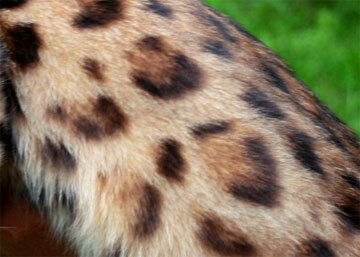 Some Bengal cats have glitter which looks like someone sprinkled gold dust all over their coat. Glitter is actually the reflection of light that is absorbed at the hollow tip of the hair shaft giving this impression. Owning a Bengal cat is a wonderful experience that everyone should have at least once in their life. The modern Bengal cat is strong, brawny, athletic animal, mobile, self-assured, friendly and curious, possessing force, dexterity, balance and grace. These cats have size from an average to the large. Its wide nose, convex small pillows of moustaches, big oval, almost round, eyes at rather small head give out a kind and a sight of a wood night predator. Its slightly bent, almost direct, a profile and rather short with the wide basis and the rounded off tips ears add a characteristic unique kind of Bengals. A short dense wool - it is unique soft and silky to the touch. The wool can be shining or not, without preference. The thick tail lowered downwards to average length finishes an image of a cat. evident contrast between almost white bellies and gold backs.